Coloured paving must be able to withstand a wide variation in weather conditions. NatraTex has the quality and longevity to take on the broadest of weather conditions experienced in the United Kingdom. The past 12 months to the end of January 2019 has seen the icy blast and heavy snow of the “Beast from the East” send temperatures plummeting. This harsh cold snap delayed spring which led, in contrast, to a scorching hot summer. The mercury rose to readings not seen since the hot summers of the late 1970’s. Being an island in the path of weather fronts coming off the Atlantic, Great Britain is well known for regular downpours of rain too. All through these changing meteorological patterns, the coloured paving by NatraTex has stood strong, delivering weather resistant surfacing to locations nationally. 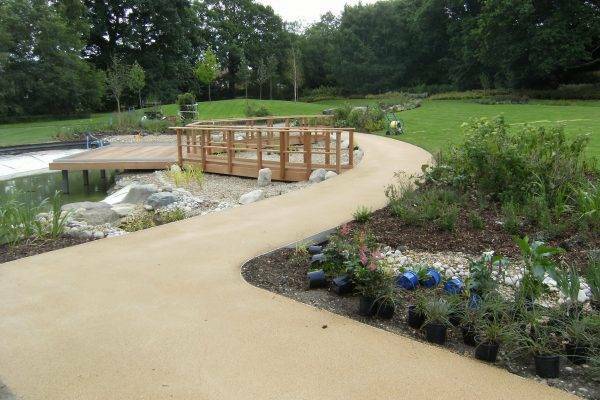 NatraTex surfacing is specified by architects and developers because it is robust enough to endure high levels of footfall and traffic, and changes in weather conditions. The variety of places it can be found is as diverse as the colour spectrum of aggregates. From park footpaths to golf courses, school playgrounds, car parks and residential developments. This synthetically bound alternative to resin arrives hot to the site ready for working and can be laid like traditional macadam. The finished result is a beautifully smooth coloured paving which can tolerate this country’s weather conditions, plenty of use and still hold onto its aesthetics. Through the proven versatility of this decorative surfacing product, we know that we have a coloured paving solution for your project. With our “can do” attitude, the team at NatraTex will support you through the process of supplying and implementing your surfacing. We deliver a high quality service and products so that you keep the surfacing aspect of your project to budget and schedule. Contact us today for how we can help you.